Figures have been released from the U.S. Bureau of Labor Statistics that shows that the Scrap Recycling Industry had added 10,000 jobs between the first quarter of 2010 and the first quarter of 2011. 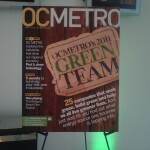 Today, every major corporation is making a green effort, and while it is great PR, it is also great business practices. “Going green isn’t just about saving the environment or saving face, it’s about saving money,” says green lifestyle expert Sara Snow, author of Sara Snow’s Fresh Living. You might think you do not have time to worry about the Earth while at work, but you really can’t afford to not at least put in an effort. What do millions of tons of scrap steel have to do with family? The answer is everything! SA Recycling is a noisy, grimy and booming company that you have most likely driven past a dozen of times but never seen! The scrap yard is filled with giant machines that resemble your child’s favorite things: Dinosaurs, Transformers and even WALL-E the robot! is targeting consumers who want to get rid of old appliances and cars. Today, Earth Day, SA Recycling is officially launching 1-800-GOT-SCRAP, a new service that will pick refrigerators, stoves and other items up. The pickup service, normally available for a $25 fee, is FREE today in honor of Earth Day. Those wanting to avoid the pickup fee can drop off those unwanted appliances at an affiliated recycling center for cash. Free pick up April 18-22! Pickup is subject to our normal service areas and not all areas will qualify. 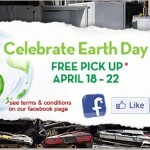 Call 1-800-GOT-SCRAP (1-800-468-7272) and mention the Facebook Earth Day promo. During today’s convention and expo, ISRI, is expected to release the preliminary results from its electronics recycling survey. Recycle The Right Way And Get Rewarded! Kroger, Coco-Cola and different organizations in Nashville, Tenn. have teamed up to launch a new recycling awareness campaign. This initiative will award Nashville residents who recycle the right way a $50 Kroger’s gift card. New Report on Green Commerce! The Green Products Roundtable, a group formed to help private and public institutional buyers make informed environmentally-minded purchasing decisions, has released a new report on green commerce. A New Jersey metal recycler, Metalico Inc is planning to install a massive metal shredder. This heavy-duty machinery will take up less than half of the space which leaves room for other scrap-metal activities.